There’s a universality to coming-of-age stories. Through the experience of their young protagonists, the best of these tales aim to illustrate a turning point, an emotional maturation, a fuller understanding of the world—in short, the transition from childhood innocence to adult understanding. I, for one, am a pretty easy mark for such narratives; they sometimes trigger not only empathy, but a surprisingly vivid recollection of experiences and feelings from my youth. Given the plethora of works in this genre, I suspect I am not alone. The Bildungsroman has been a staple of American literary fiction from Huck Finn to Holden Caulfield, and of the movies as well, with a pretty endless list of American classics such as Rebel Without A Cause (1955), Stand By Me (1986), Boyhood (2014) and many more, not to mention foreign classics like The 400 Blows (1959), Murmur of the Heart (1971), and Cinema Paradiso (1988). When we are blessed with a coming-of-age picture that not only pulls us into a young character’s experience but in so doing also exposes us to a political or cultural universe quite different from our own, our own understanding of the world expands, as in Lee Daniels’ Precious (2009) or the Dardenne brothers’ La Promesse (1996). Such is the case with the engaging new movie A Borrowed Identity, by Israeli filmmaker Eran Riklis (Zaytoun , The Syrian Bride ). In the wake of Israeli Prime Minister Netanyahu’s recent fear-mongering, election-day statements about his country’s Muslim citizens, the US release of this humanistic exploration of the Arab experience is certainly timely. Riklis is one of the most prominent and successful directors in Israel; and Arab-Israeli issues have frequently been a topic in his movies. Take for example, his 2008 feature, Lemon Tree, in which ethno-religious hate and discrimination were front and center in a story ostensibly about a legal conflict between two neighbors: a Palestinian woman and the Israeli defense minister who moves into the villa across the street from her lemon grove. Riklis’ new movie has a lighter touch. 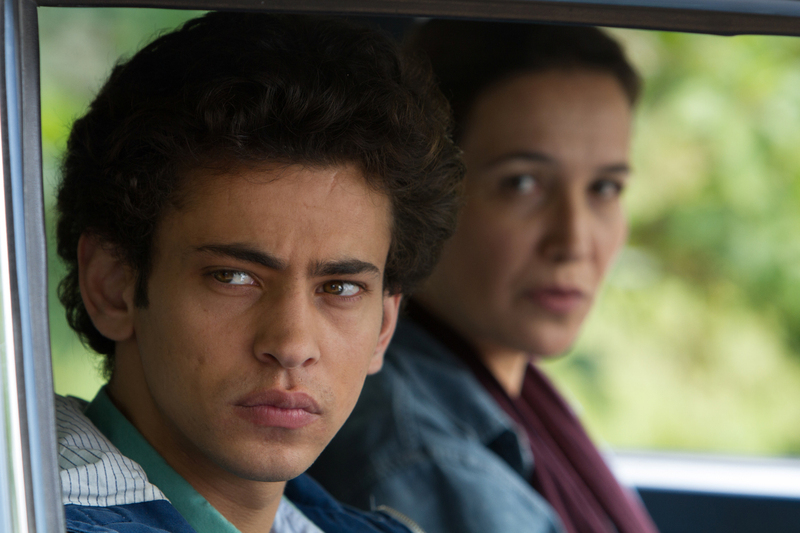 A Borrowed Identity is the story of a young Israeli Arab boy, Eyad, as he comes face to face, for the first time in his life, with the predominant Jewish society and culture of his country. On his arrival at the academy, Eyad finds himself a complete outsider. In the Palestinian community and in his former school, the Jewish majority were always referred to as “they” or “them”; now he is the other. 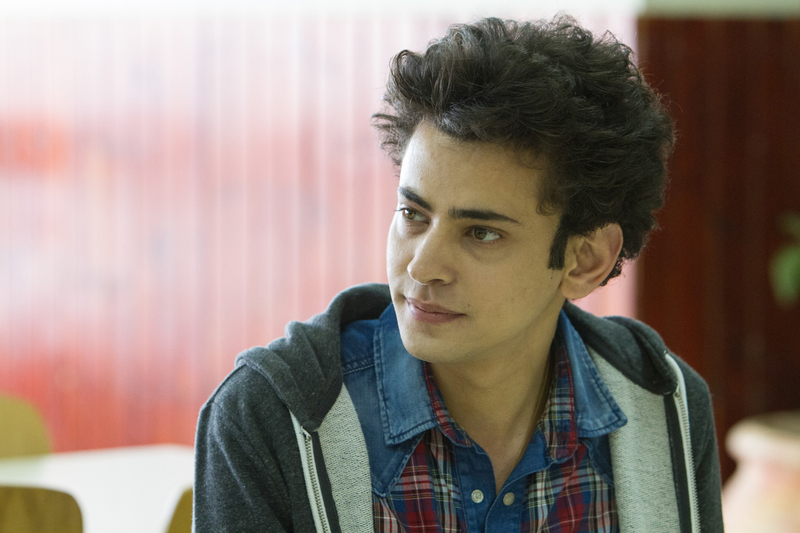 Eyad comes from a culture that is alien to his Jewish classmates. His clothes are different; his Hebrew is halting and his pronunciation a source of derisive humor (embarrassingly, he can’t enunciate a “P” sound); he is on scholarship and has little money, while most of the Jewish students are affluent; and no one, it seems, can be bothered to pronounce his name correctly. As time goes on, he begins to adjust. 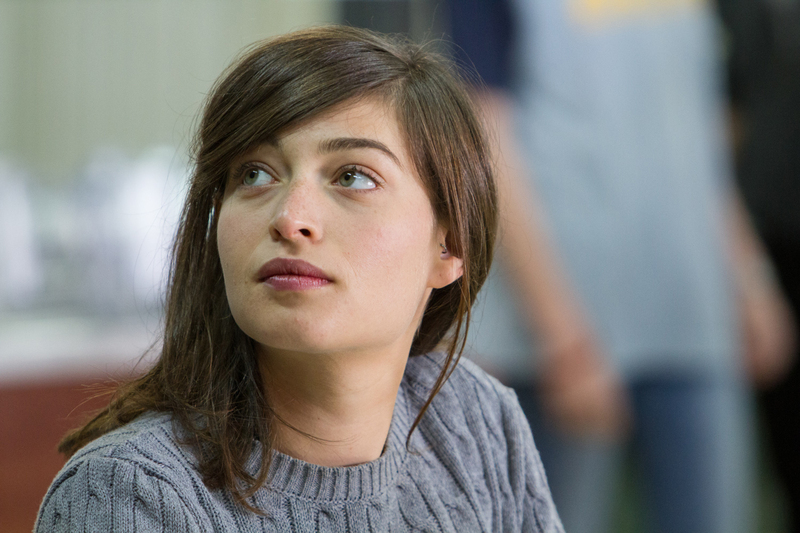 Soon he is befriended by and begins to develop a romantic relationship with a Jewish girl, Naomi. Given the separation of and enmity between the Arab and Jewish communities, their love affair can’t be acknowledged in public. Naomi clearly understands just how unacceptable and scandalous such an affair would be in her world: “Tell me you are a lesbian, tell me that you’re a drug addict or that you have cancer, but don’t ever tell me you have an Arab boyfriend,” her mother has warned. Eyad also makes another Jewish friend—a boy named Jonathan Avrahami. 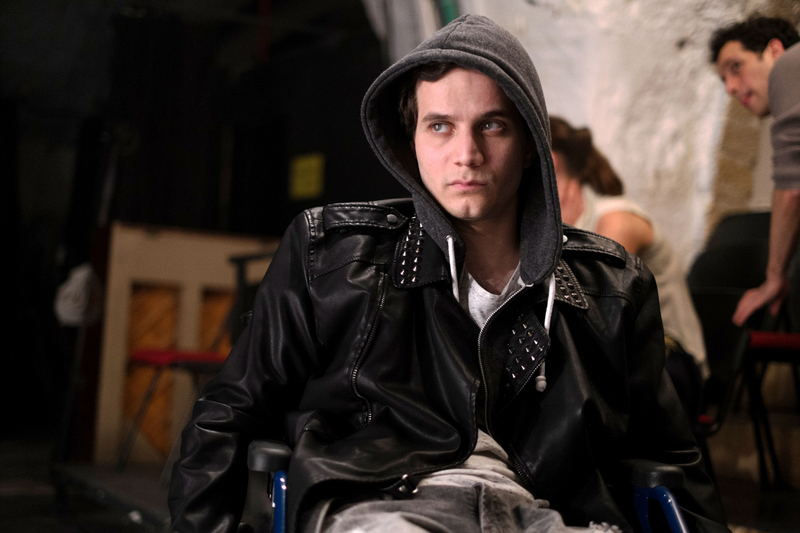 Jonathan, who uses a wheelchair, has his own set of problems: an unhopeful muscular dystrophy prognosis. He is isolated, and aside from Eyad, friendless. The two boys share an acknowledged perspective as outsiders, along with a love for underground rock music, and a wry, somewhat dark sense of humor. Jonathan lives with his doting lawyer mother Edna and, as Eyad comes to spend more and more time with them, they become like a second family to him. Eyad stands at the border of two cultures existing side by side in one country. We see this world through his eyes. It is, of course, not an altogether pretty picture. For one thing, the communities are physically segregated from one another, with Eyad’s people living in what are essentially Arab ghettos, while the Jews live in the much more modern cities and suburbs. The Arabs are comfortable with their own, but resentful, distrustful, and alienated from the Israeli majority. This is depicted in multiple ways, mostly humorous, in the film: when a visiting American, who is promoting a “Children For Peace” program, speaks to Eyad’s grade school class, the school principal intentionally mistranslates his remarks to reflect negatively on the Jews (and on his students, whom he calls morons); during the first Gulf War, Eyad’s father and friends, watching the evening news, root for Sadaam Hussein to win as if this was a sporting event; and when an Iraqi scud missile flies overhead, people dance and cheer on Tira rooftops, while Grandma mutters, “Please God, for once give the Muslims a victory.” Yet, while the long history of Jewish-Palestinian conflict and displacement, with the wildly different nationalistic narratives and accusations that have grown up around it, is part of the background, A Borrowed Identity focuses its interest and ours on the human element, on the personal. Through his developing relationships with Naomi and with the Avrahamis, Eyad realizes that—ethnic/nationalistic mythology and propaganda aside—Jews and Arabs, as people, as individuals, are no different from one another. He seems to sense that mutual understanding and coexistence could, should be possible. He has come to know, to like and to love individual Jews, and they like and love him back. At the same time, Eyad feels more and more outside the mainstream back home in Tira. And he experiences prejudice in the broader Jewish world. Waiting at a bus stop in Jerusalem with his girlfriend, he is confronted by neighborhood bullies, who taunt him with a song about Mohammed and his “ugly daughters.” He learns that, as an Arab in Israel, his opportunities are seriously constrained. No one will hire him as a waiter, but when he eventually gets a job as a dishwasher, he finds that the kitchen staff is entirely Arab. Even there, accommodations must be made: his coworker “Muki” is really Mohammed; Jamal is called “Jimmy.” Eyad gets it: if he is to be accepted, to get ahead, to be a part of the broader society, to thrive as a human being, his Palestinian identity is a handicap, if not a bar — socially, professionally, economically. Eyad is smart and ambitious. He likes the life he has seen and experienced at his elite school, in the company of Naomi and in the world of Jonathan and his mother. He has even passed himself off as “Jonathan” on occasion. He knows that eventually, he has to make a hard moral choice. The film opens with a quotation from the Palestinian poet Mahmoud Darwish: “Identity is our legacy and not our inheritance, our invention and not our memory.” This then is the underlying theme of the picture, as reflected in its title. Immediately after this quotation, and before the story gets underway, we are told that 20% of Israelis are Arabs, a figure that translates to approximately 1.6 million people. So, we know from the outset that Riklis’s intention is not simply to tell a story about one young man’s experience. No longer. Last summer he and his family moved from Israel to the US for a university job (although he continues to write for Haaretz). He says his hope has died. And yet, and yet he wrote the screenplay for this illuminating, touching and engrossing movie. Maybe there still is a glimmer of hope. A Borrowed Identity is an engrossing and entertaining film, by turns illuminating, funny, dramatic, romantic, and touching. The performances of the three young leads, Tawfeek Barhom as Eyad, Daniel Kitsas as Naomi, and Michael Moshonov as Jonathan, are believable and endearing. 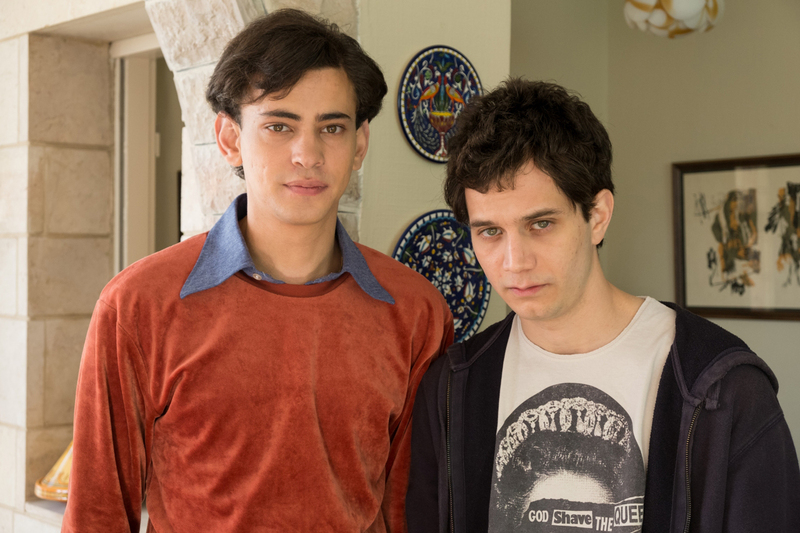 Barhom reminds me in a way of Ellar Coltrane who played Mason, the boy in Boyhood, perhaps because Eyad, like Mason, is very much the observer. Also notable are the main adult actors, Yael Abecassis as Edna and Ali Suliman as Eyad’s father. Much of what we’ve been reading and hearing about Israel over the last several years has been about geopolitics, terrorism, and war. This professional, provocative and poignant picture is about people. Opens Friday, July 24, 2015 at Landmark’s Opera Plaza Cinema in San Francisco, the Rafael Film Center in San Rafael, Rialto’s Elmwood Theater in Berkeley, and Camera 3 in San Jose. For screening info across the US, check here. For more about Sayed Kashua, here are links to two essays he wrote for the Guardian: Why I Have to Leave Israel [July 19, 2014] and Dear Mr Netanyahu: Sorry We Dared to Dream…[March 15, 2015]. 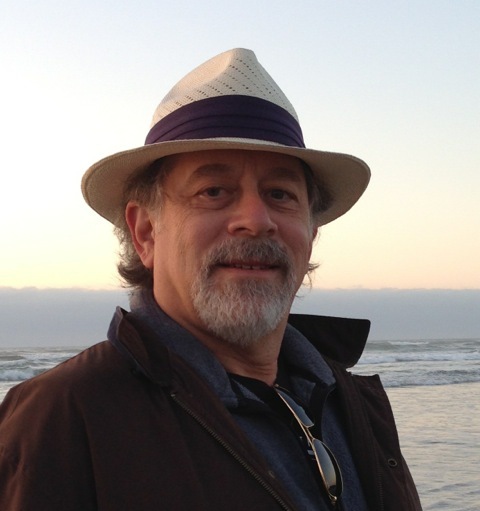 This entry was posted in Columnists and tagged Len Weiler. Bookmark the permalink.